A rare flower facing extinction in Britain is making a recovery in the grass verges of an East Hampshire town. 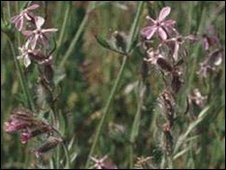 The sticky catchfly, which has short leafy shoots and conspicuous bright pink flowers in early summer, is blossoming in Whitehill Bordon. Environmental enthusiasts who uncovered five flowers in 2008 have helped cultivate their number to 100 over the past year, the district council said. Changes in agricultural practice, such as use of herbicides, led to a decline. Mayor of Bordon, Dr Bill Wain, from the environmental conservation group, said: "The catchfly is a beautiful little flower that has sadly diminished. "I am delighted that we have found these flowers and can help them re-establish themselves in Whitehill Bordon." The council said arrangements had been made for the area to be maintained and for grass cutting to take place outside flowering season to protect further growth of the species. The area is also a Site of Importance to Nature Conservation.